A program led by West Virginia State University (WVSU) Extension Service is helping West Virginians struggling with substance use disorders to make smarter, healthier choices on their road to recovery. 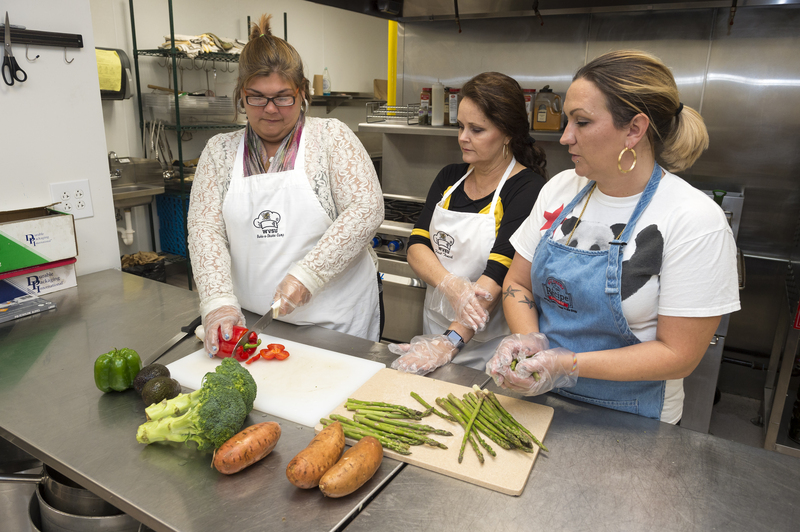 An initiative of the USDA, the Expanded Food and Nutrition Education Program (EFNEP) provides instruction on health, nutrition and physical activity but does not traditionally target recovering addicts. With West Virginia being labeled by some as “ground zero for the opioid epidemic,” WVSU is taking a unique approach to help people in need. While the program traditionally targets low-income families, Hauldren began offering the EFNEP classes at sites such as Recovery Point in Charleston and Huntington to help people in recovery learn the basics of good health and nutrition. Through weekly classes, participants are learning to be more physically active, drink more water and spend wisely at the supermarket. “Often, our participants know little about grocery shopping and how to spend their money on healthy items in the store, so we cover everything from how to make a list to buying lean protein and making three healthy meals from it,” Hauldren said. Such information is proving invaluable, as Hauldren has seen firsthand. Lessons on health-conscious spending, proper nutrition and serving sizes are supplemented with physical activity to get participants moving. Another first, she said, is building trust. While EFNEP requires six lessons for each course, Hauldren has expanded that to 10 to help establish and nurture a relationship with participants. The approach is paying off, as Hauldren has seen participants learn and benefit from making healthy choices by the end of her time with them. Hauldren is thankful, she said, because the need for programming like EFNEP is so great in West Virginia. The state has one of the nation’s highest rates of deaths from drug overdoses. As people move into recovery from addiction, understanding how nutrition and physical activity play a role in that process is vital. Hauldren maintains a growing waiting list of organizations wanting EFNEP. In addition to Recovery Point Charleston and Huntington, she has brought EFNEP to such sites as Putnam County Drug Court and the Pregnancy Connections program at Thomas Memorial Hospital. She will soon begin offering courses at a site in Wayne County. Developed by the USDA in 1969, EFNEP has successfully addressed critical societal concerns by employing paraprofessional staff and influencing nutrition and physical activity behaviors of low-income families, particularly those with young children. Through a community-based, relationship-driven, hands-on educational approach, EFNEP has directly impacted economic obesity and food insecurity challenges that hinder the health and wellbeing of the nation. To learn more, contact Hauldren at (304) 552-0075 or hauldrta@wvstateu.edu. Grocery shopping has become quite a chore for Robin Turner. The WVSU extension agent spent the better part of 2015 learning about the proper handling and storage of fresh produce for the University’s new cold chain initiative, which educates farmers on how to keep their crops fresher longer during the post-harvest process. Now armed with a wealth of knowledge of proper food handling and storage, Turner is on a mission to impart the same education onto the state’s farmers, with the ultimate goal of providing the consumer with better fruits and vegetables. Thanks to a grant from the USDA’s 1890 Capacity-Building Grants Program, she’s well on her way. Turner spent the fall and winter providing training to a series of 20 farms during the first pilot phase of the program. Through a series of four workshops, participants learned about all aspects of care before harvest, after harvest, all the way to the consumer, using proper cold storage techniques. Cold storage, or cold chain, technology refers to the proper refrigeration and storage of crops during the time between harvest by the farmer and end purchase by the consumer to help ensure peak freshness. But, it’s more than simply temperature control – it’s a scientific process with multiple facets of instruction. One facet, for example, is educating farmers on information they can share with the buyer to prolong the life of the fresh produce. It’s all meant to create a healthier system of locally grown produce in the Mountain State. Arming the state’s small farmers with knowledge about post-harvest, cold storage technologies will help fill the gap that currently exists in farmer education. The resources that do exist, Turner says, tend to target large-scale producers, not necessarily the family farmer peddling wares at the local farmers market. Part of the problem is not only a lack of education but also a lack of affordable resources. WVSU’s project is not only providing the needed education but also looks to provide the same high-level resources available to large-scale producers at a more affordable price. “We’re hoping to show them, ‘here’s what the big guys can do, and here’s how you can implement the same practices on a smaller, more affordable scale,’” Turner says. Teaming with the West Virginia National Guard, WVSU Extension Service is helping repurpose many of the state’s former armory sites into agricultural education and resource centers, complete with cold storage equipment and technology that will be readily available to small farmers. Turner has been providing workshops through the project at armory sites already, and demand is increasing. The pilot phase targeted 20 farms in a regional cluster, and organizers plan to expand into new regions of the state soon. In the meantime, Turner will continue working with the pilot participants to ensure they are correctly implementing what they learned during winter training into the farms during the growing season. 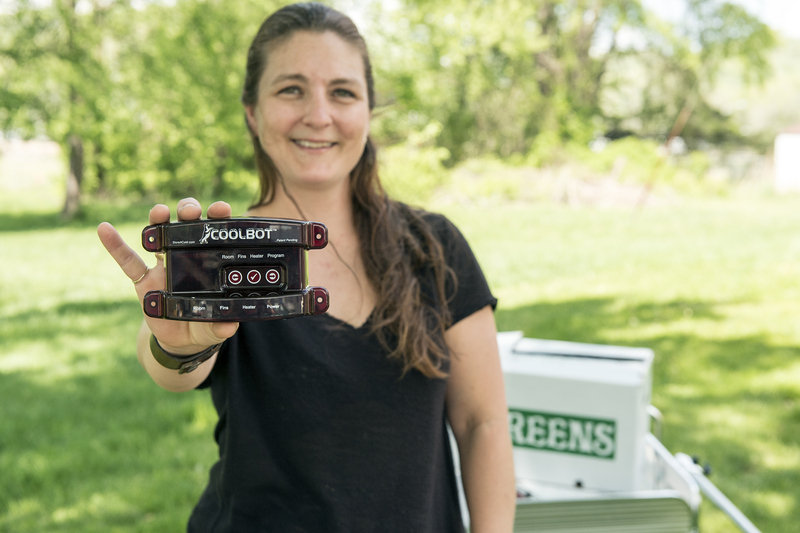 She’ll be performing site visits this spring and summer, providing farmers with technologies such as CoolBot thermostatic controllers and cooler systems to incorporate into their practices. The cold chain initiative is supported by the USDA 1890 Capacity Building Grants Program Award No. 2014-38821-22397 and the 1890 Center for Excellence Award No. CSF-1609-W.
Did you know West Virginia currently ranks fourth in the nation for grandparents raising grandchildren? According to 2010 U.S. Census data, more than 40,000 children under the age of 18 in West Virginia are living in homes where the householders are grandparents or other relatives. To help meet the needs of this unique family dynamic, we’re partnering with the WVSU Department of Social Work to launch the new Healthy Grandfamilies initiative. The project is a series of free workshops and follow-up support targeting grandparents who are raising one or more of their grandchildren. Participants are provided three months of free follow-up services with a Licensed Social Worker. Such services include assistance with locating community resources, confidential help in meeting unique family needs and advocacy services. Workshops are slated to begin this spring in the St. Albans area. The initiative will kick off with a meet-and-greet style Open House on Tuesday, April 26, from 3:30 p.m. to 7:30 p.m. at First Baptist Church of St. Albans. Learn more about the WVSU Healthy Grandfamilies project on our website and Facebook page. Healthy Grandfamilies is funded by the USDA’s Capacity Building Grants Program, Award No. 2015-38821-24374.